It's the beginning of autumn which means blushing apples are falling from the trees and squirrels are starting to collect nuts. 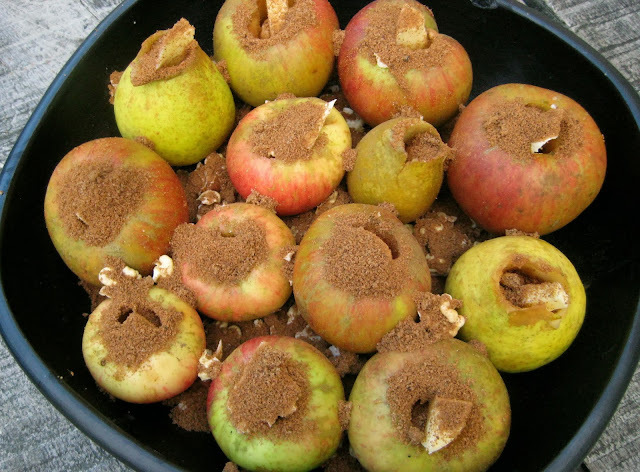 The other day I collected some apples, pears, fresh walnuts and hazelnuts from the garden and made a super simple autumn dessert. It doesn't win a beauty prize, but hey, it's not all about the looks right? Wash the apples and remove the core with the apple corer. No need to remove the skin; it's essential for the baking process as it keeps the apples very soft on the inside. Place the apples in an oven-proof dish. 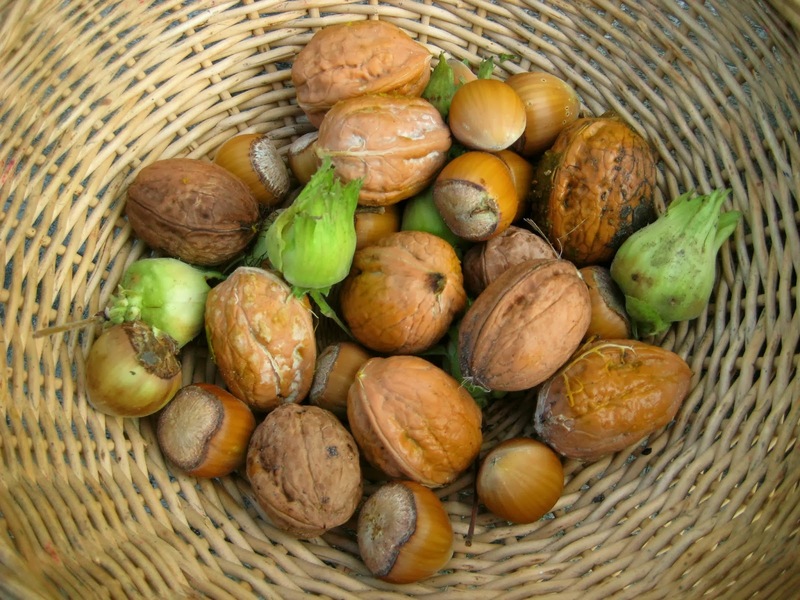 Crack the nuts open, and scatter them over the apples. Cut the butter into small pieces and place a piece of butter in the core of each apple. Mix the brown sugar with the cinnamon and add it to the apples. Place the dish in the oven at 180 degrees and leave it for about 1 hour and 30 min. Mine were in an AGA for more than an hour and they were perfect, but it really depends on which oven you're using. The apples are ready when the skins have "cracked" and nicely browned. The apples should be fluffy looking on the inside and very very soft. 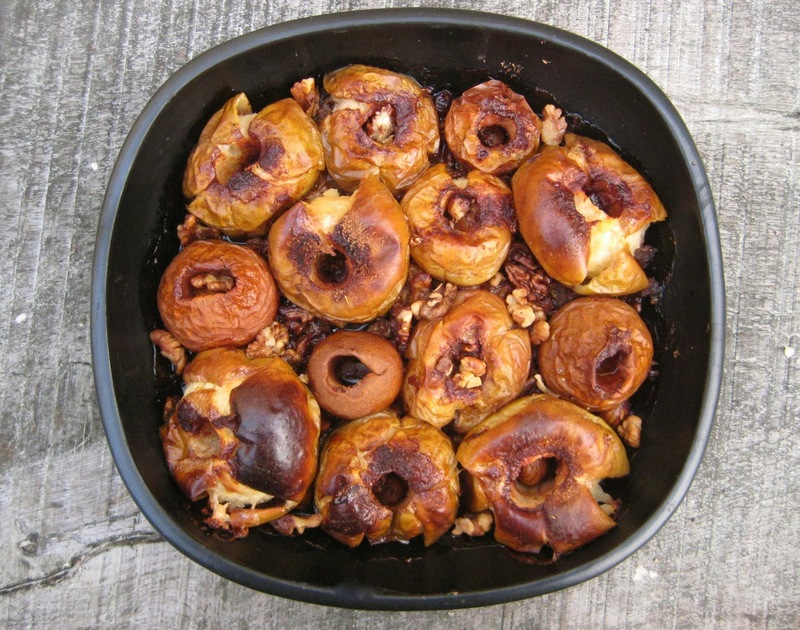 The nuts are caramelized which make them perfect in combination with the slightly sour but soft apples. There were some pears in this dish, which is also a nice variation to this recipe. I love this recipe because it takes two seconds to make, and it's also pretty healthy as there's so much less sugar and butter than in most desserts, and it has nuts. My kind of comfort food, perfect to start the autumn with!